On July 20th yet another of the BBC correspondents who have been ‘parachuted in’ to provide backing to the regular team made a filmed report for BBC television news. 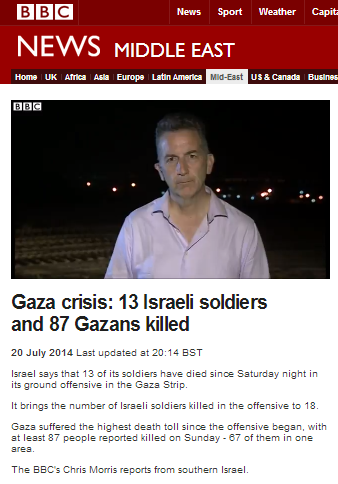 Europe correspondent Chris Morris’ report also appeared on the BBC News website’s Middle East page under the title “Gaza crisis: 13 Israeli soldiers and 87 Gazans killed” and there the synopsis promotes unsourced casualty figures – with no evidence of independent verification by the BBC – which once again fail to make any distinction between civilian and terrorist combatant casualties. “Well those thirteen soldiers were killed in several incidents overnight in and around Shuja’iya. 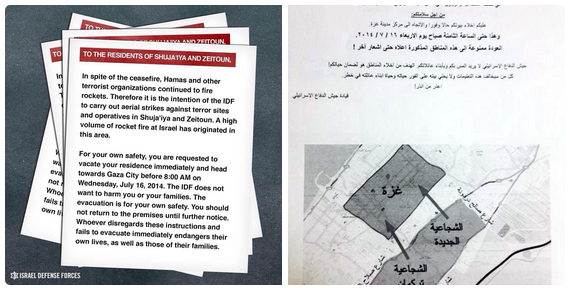 I think it shows that they ran into fierce resistance from Hamas fighters in that district. And to put it into contact [sic], losing thirteen soldiers in one day that’s more than Israel lost in a three-week military campaign the last time it went into Gaza on the ground in 2008/2009. 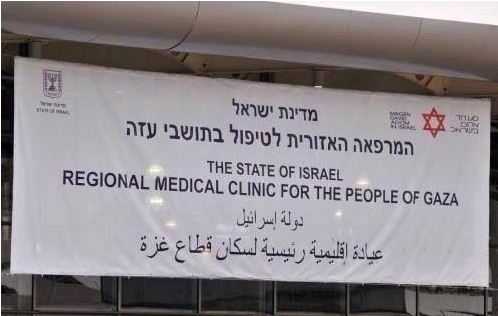 So it will be a big shock that number to Israeli society. Clearly then Morris’ claim that PM Netanyahu “accused Palestinians of using telegenically dead civilians for propaganda purposes” is inaccurate. In fact, Netanyahu said that Hamas – not Palestinians in general – has an interest in creating high numbers of civilian casualties for propaganda purposes. But like the rest of his colleagues, Chris Morris does not seem to be interested in informing BBC audiences about the reality of Hamas’ use of human shields. Of course contrary to Morris’ insinuation, that statement does not in any way contradict Netanyahu’s expression of regret for civilian casualties. And what of Morris’ claim that PM Netanyahu “seems to tailor his message to the specific audiences” and the ensuing implication of the insincerity of the message? Well apparently Morris was not listening closely enough to that July 20th interview with BBC Arabic. Here is the relevant excerpt from the transcript of that interview – which as readers will see is actually very similar both in content and in style to the one given to a US TV station. 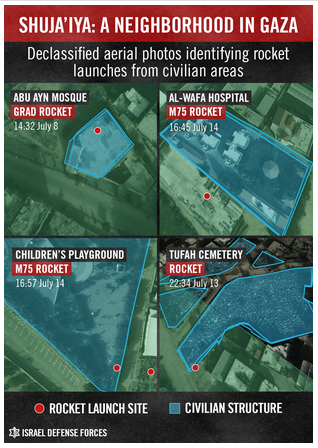 The fierce fighting between the IDF and Hamas terrorists in the Gaza City neighbourhood of Shuja’iya on July 20th was the subject of a considerable number of BBC reports across various platforms. In this post we will look at some of the themes those reports promote. An audio report from July 20th by Lyse Doucet includes a doctor from Shifa hospital talking about “this massacre”. In a July 21st radio interview with the BBC World Service radio programme ‘Newsday’, a doctor from Shifa hospital is heard talking about “the massacre at Shuja’iya”. Whilst frequent and ample description is given of IDF “shelling”, “bombardment” and “pounding”, any sort of information at all on the terrorists which the IDF was fighting in the Shuja’iya neighbourhood is extremely rare and any reporting on what those terrorists were doing or what sort of weapons they used is even rarer. 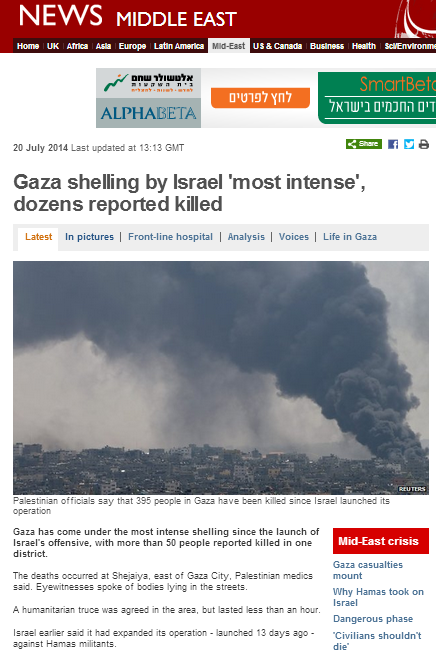 That of course means that the overall impression given to BBC audiences – inaccurately and misleadingly – is that the IDF was attacking civilians when in fact those civilians were caught up in a battle between the Israeli army and Hamas’ heavily armed militia. “There were some rockets that were fired near there and the fighting broke out again according to one of my colleagues who was at the scene”. “In Shejaiya we saw Hamas spotters taking up positions on empty streets, talking into telephones and walkie-talkies as they maintained a lookout. Notably, no mention is made of the terrorists’ use of weapons beyond guns – such as RPGs and anti-tank missiles. Neither is any mention made of the practice of booby trapping houses or of secondary explosions resulting from strikes on buildings in which weapons and/or explosives are stored. Thus, BBC audiences are mistakenly led to believe that all civilian casualties in Shuja’iya are exclusively attributable to IDF fire, although the likelihood of that being the case is extremely low. And as for the Hamas terrorists? Well they just talk on the phone and wander around in balaclavas according to the BBC. None of the numerous BBC reports makes any attempt whatsoever to determine how many of the casualties in Shuja’iya were Hamas combatants. 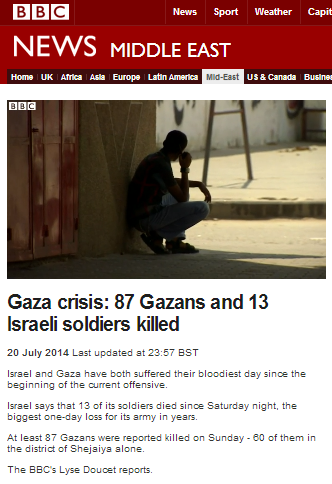 In all the reports general figures are given and as has been the practice in the past, BBC audiences are not adequately informed of the fact that those figures come from Hamas sources or of the additional fact that the BBC has not independently verified those numbers. Those omissions are particularly relevant in light of the instructions issued by the Hamas Ministry of the Interior, from which it is clear that there is an organized Hamas campaign to inflate the numbers of civilian casualties and conceal the number of dead combatants in order to influence public opinion abroad. Whether by accident, by design or by coercion, the BBC seems to be following the Hamas instructions closely, but of course it is actually the job of BBC journalists to cut through a terrorist organisation’s propaganda and bring the real picture to audiences. With regard to the all-important topic of combatant casualties, the BBC has come nowhere near to meeting that objective. We have of course addressed the topic of the sources of UN OCHA supplied casualty figures here previously and in addition, a UNICEF information officer informed BBC Watch that its own figures – collected independently – include anyone up to the age of eighteen in the category of children. Notably, according to the latest UNICEF figures from July 21st, the number of male casualties under 18 was well over double the number of female casualties. As is well known, Israel gave the residents of Shuja’iya prior warning of the necessity to evacuate the neighbourhood four days before the operation and even delayed it in order to give them more time to organize their move. That fact is not mentioned in the vast majority of the reports on the subsequent events and the concurrent fact that Hamas instructed the residents to stay put and act as human shields is not conveyed to BBC audiences at all. “Israel said it repeatedly warned residents to leave the area. “We asked them to leave again and again,” Israeli Prime Minister Benjamin Netanyahu told BBC Arabic TV. The fierce fighting between the IDF and Hamas terrorists on July 20th in Shuja’iya undoubtedly included many tragic scenes which were the result of civilians who had been advised to evacuate being caught in the crossfire – and it is upon those scenes which BBC reporting has exclusively focused. Whilst that may make for ‘compelling’ television or ‘powerful’ radio, it does not necessarily give BBC audiences the background and context which they need in order to be able to understand the entire picture of what happened there and why. The BBC’s reporters currently on the ground in Gaza have so far failed to provide audiences with many if not most of the vital parts of that picture. 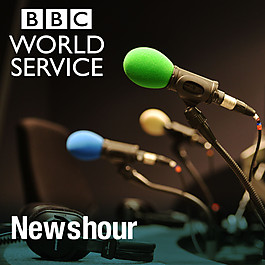 On the afternoon of July 20th the BBC promoted an item by Lyse Doucet included in its World Service’s ‘Newshour’ radio programme. That report – which is one of the most blatantly manipulative items the BBC has produced in the last two weeks – can be heard here. No context is provided, no background, no facts. The entire item is deliberately aimed purely at the level of emotion. “From midnight last night and throughout the night the soundtrack of Gaza was one of endless pounding and constant shelling and anyone who heard those sounds in the dark of night knew just how intense the military operations were and if you lived through that, that kind of intense bombardment, you were lucky enough to survive to tell the story this morning. And through most of today the shelling has continued. We spent hours there; we just returned and I’m going to share now an audio postcard from one of the neighbourhoods east of Gaza City that’s been under fire – Shuja’iya. Now we’re in the rubble of the building that’s been shelled last night. The medics have rushed in. One…two…half a dozen medics in their…with their hands…they’re searching through the rubble. The sheets are ready, stretchers here and you can see body parts protruding…you can see the body parts protruding, buried under rocks and rubble, sand. And bits of torn cloth. This is a morning where the ambulances, the workers, are on the run. Another pulling…they’re pulling the material. See them pulling the material. My God. There’s a man emerging. The sound of shelling and the people are running. People are running everywhere you look. Bodies are being dug from the rubble. People are running and the sound of shelling, bombardment that went on through the night is continuing now in the day. Black clouds of smoke, white smoke as well, rising just beyond where we’re standing at the end of this street. Everywhere you look on these streets people are trying to escape. Now coming down this road I can see two women. One young and the other with her an elderly woman with a long black coat, a white scarf and she’s holding as high as she can a piece of cloth – a white piece of cloth – a flag of surrender – as if that’s going to protect her. But she walks with dignity down this street. Allowing unchallenged free rein – and amplification – to the Doctor’s baseless claim of a “massacre” carried out “intentionally”, Doucet makes absolutely no attempt to report accurately or impartially on the events in Shuja’iya. No effort is made to explain to audiences that the residents were advised to evacuate four days previously, that Hamas ordered them to stay to act as human shields or why military action was necessary there. No inquiry is made into the topic of how many of the dead and injured civilians were actually killed by terrorist fire and notably, the words ‘terrorists’ and ‘Hamas’ do not appear at all in this report. No mention is made of Hamas’ missile launchers, tunnels and weapons stores located in the neighbourhood: all that would detract of course from the gut-wrenching, emotional picture she so earnestly tries to paint. Emotional reactions such as those the BBC’s chief international correspondent is deliberately trying to solicit in this item produce judgement. When audiences are prevented from seeing the whole picture in its proper context as they are in this item, such judgement is necessarily flawed and can even be dangerous. And that is how a lethal narrative is created. Lyse Doucet and her colleagues know that very well. They – and we – have been there before.